This toilet tank combines water efficiency with the versatile style of the Cimarron collection. A 1.28-gallon flush provides significant water savings of up to 16,500 gallons per year, compared to a 3.5-gallon toilet, without sacrificing performance. This tank features innovative AquaPiston(R) technology, a patented flush engine that delivers a fast, powerful, and virtually plug-free flush. An insulating liner helps prevent condensation on the outside of the tank. Pair this tank with the K-4829 or K-4347 bowl for a unified look. Memoirs Comfort Height 1.6 Gpf Toilet Tank Only With Aquapiston Flush Technology In White The sophistication of traditional design serves as the inspiration for the Memoirs collection. With its rich detailing, this suite of products echoes the stylized lines of historically renowned furniture and architectural design. Two styles offer different dignified interpretations - the clean, crisp lines of the Stately design, and the added rounded detail of the Classic style, which resembles crown molding. With fixtures and faucets available, the extensive Memoirs collection can accommodate both large and small bath and powder rooms. 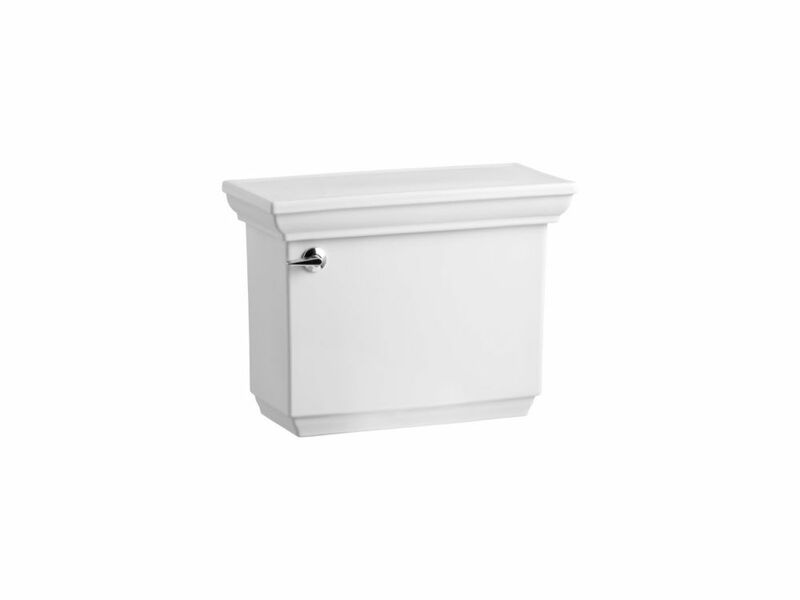 Memoirs Comfort Height 1.6 Gpf Toilet Tank Only With Aquapiston Flush Technology In White is rated 4.5 out of 5 by 20. Rated 5 out of 5 by Don from I am replacing my 2 Kohler toilets that were very... I am replacing my 2 Kohler toilets that were very dependable for 25 years. These appear to have the same quality to have that type of longevity also. I do like the comfort height and they were ease to installed. I am also pleased to buy a product that is made in the USA. Rated 4 out of 5 by ma1grm0808 from Works fine but a lot noiser when flushing then the regular 'flappper' type tank. Works fine but a lot noiser when flushing then the regular 'flappper' type tank. Rated 2 out of 5 by HomeDepotCustomer from Because of the porcelain molding on top of the tank,... Because of the porcelain molding on top of the tank, a lid won’t stay up unless you hold it. Very nice looking toilet though. Rated 5 out of 5 by James from Easy to order, shipped on time, picked up at store, easy to handle because the unit was packaged ... Easy to order, shipped on time, picked up at store, easy to handle because the unit was packaged in two separate boxes, no damage, plumber installed unit very quickly. Best of all, I got exactly what I ordered and am very happy with the complete installation and product I received.